Ah the promise of a new sewing project. 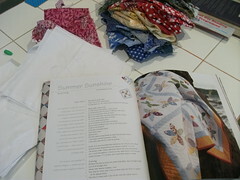 I love the anticipation of picking the pattern and fabric. I was looking for a “slow burn” project that I can work on in front of the television when I am not feeling like hauling the machine out. I did all the prep of the applique project and it took almost a full week of work at night to get all the pieces cut, marked and sorted ready to sew. The best thing about this project is it is portable and ready to sew now that all the prep work is done. I started the first block last night and it is so easy and relaxing- the opposite to some of the brain teaser quilts I have done in the past. One block down as of last night, 35 more to go. Slow burn project indeed. I just finished the last appliqued leaf on the Garden Party quilt top last night and have a short breather before the next quilts. I have a few baby projects to work on next, but wanted a “slow burn” project to work on when I am not feeling like sitting at the machine. I have had my eye on this applique quilt for awhile. I also like the thought I had most of the fabric on hand. The only thing I am not happy about are the pinks that I am trying to work into the blend. I am working on all the prep for the project and will get a fresh set of eyes to look at the fabrics when I hit my classroom next week at Material Obsession.